Aims Group B Streptococcus (GBS) can cause neonatal septicaemia, meningitis and rarely, infective endocarditis. Through this case study, we aim to raise awareness of the devastating sequelae of GBS disease and the importance of early recognition of complications. Case discussion: A term infant born in good condition was being managed by the community midwifery team for feeding difficulties, failing to thrive and presented to A&E twice with lethargy and maternal concern. At two weeks of age he represented having additionally developed fever and was admitted and treated for GBS septicaemia and meningitis. He was discharged after 5 days to ambulatory care for continuation of antibiotics. 10 days into treatment his mother became worried and he presented to A&E in cardiogenic shock with a heart murmur, enlarged liver and rising lactate. Once transferred to the Paediatric Intensive Care Unit, he required ventilation and inotropic support for poor cardiac output, and conservative medical treatment for necrotising enterocolitis, presumed secondary to embolic pathology. 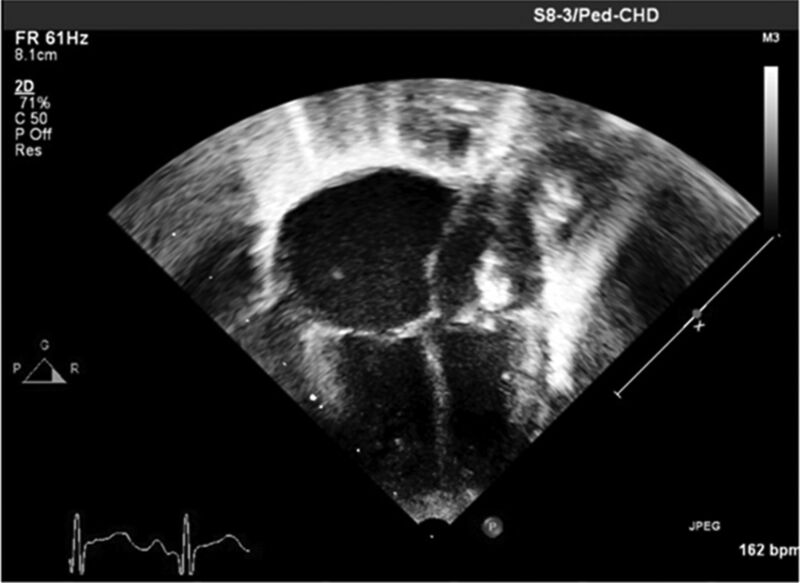 An echocardiogram demonstrated two large, mobile masses attached to the mitral valve leaflets with severe mitral regurgitation and right ventricular dysfunction, consistent with infective endocarditis in an otherwise structurally normal heart (Figure 1). Surgical repair of his valve was not possible and so a 17mm prosthetic St Jude’s Valve was placed in the mitral position. Post–operatively he developed a low cardiac output state, seizures, and recurrent thrombus formation requiring valve replacement. He is currently stable on full anticoagulation therapy. Conclusion Our case highlights the aggressive nature of GBS with potentially fatal complications requiring a high index of suspicion, as only with early recognition and management of endocarditis can morbidity and mortality be improved. We recommend that repeated parental concern in the context of failing to thrive, lethargy or fever should alert health professionals to the possibility of sepsis. Although Screening for GBS is not recommended by the UK National Screening Committee nor the Royal College of Obstetricians and Gynaecologists, it has a high profile in the United States where the Centres for Disease Control and Prevention recommends routine screening for all pregnant women, and we suggest this should be so in the UK.